I used OPI Lucky Lucky Lavender from the Hong Kong collection. This collection would have to be one of my faves, there are so many pretty colours and the quality is just great. Love that pro-wide brush! Lucky Lucky Lavender is a pastel lavender-pink colour. The colour is more pink than lavender to me which is kinda annoying because I need a nice lavender polish. It's still very pretty and applied nicely with 2 coats - 1st was streaky and the 2nd evened it out. Below is 2 coats without topcoat. 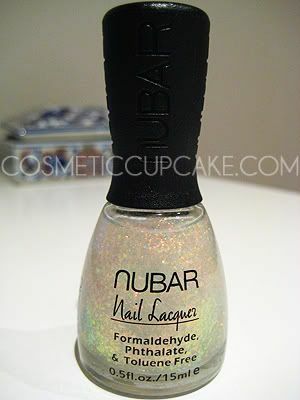 My family have been accidentally cheering me up =p My sister surprised me with 2 bottles of Nubar 2010 today!!!! One to use and one for backup ;) She knows I've been lusting after flakies for AAAAAAAAAAAGES so she tracked some down for me on Ebay for a reasonable price as a surprise! YIPEEEEEEE! 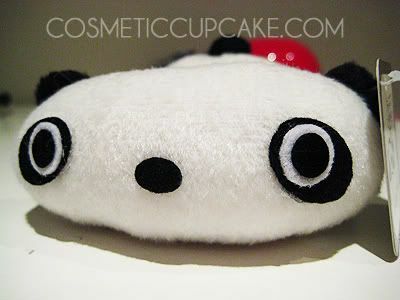 The boy gave me this tiny Tarepanda to cheer me up too =) Isn't he cute? AND my absolutely awesome Aunty just told me she snagged me MAC Mineralize Skinfinish in Stereo Rose! The collection isn't released here yet but even when it is I can't really afford MAC due to the crazy prices here. There's no way I'm paying double when I know in HK the prices are actually reasonable. I won't get my blush until I go to HK in November but just the thought is sustaining me =p Woot! Things are looking up! Hope everyone has a good weekend planned full of happy and fun activities =) I'm off to the Good Food and Wine Show tomorrow for some tasty food. Cute manicure! I loved the Hong Kong Collection. hoe u r feeling better..dun stress urself too much.. There are a lot of colors from the Hong Kong collection I have been meaning to get. I LOVE your nails btw. oooh pretty nails!! !i'm liking the pink!!! 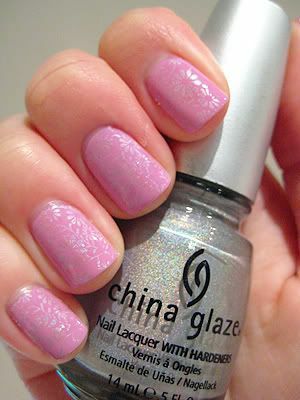 That OPI definitely looks pink in these photos, all the colours from the Hong Kong collection were amazing. I really like this mani, more than you do probably. I like how the konad intrinsic flowers look oriental and so fit the Hong Kong colour theme. I like it. that color is really pretty on you and i love the konading! @Priscilla: I am better thanks! Nail polish and retail therapy can work wonders definitely. I'd love to own the whole collection but my wallet says no haha. @Oreleona: Thank you so much! @Joan: Yeah my sis rocks! Awww I'm really glad you like the mani! @Alice: I probably own half the collection too! I'd like them all just to have the collection but I know I wouldn't use them all. @PetiteLittleGirl: You are too kind =) Glad you like the colour! Wish it was summer here already! @boonDY: I totally agree! I don't have many currently but I'm hoping to change that ;) Yes my sister is awesome when she's not annoying me!